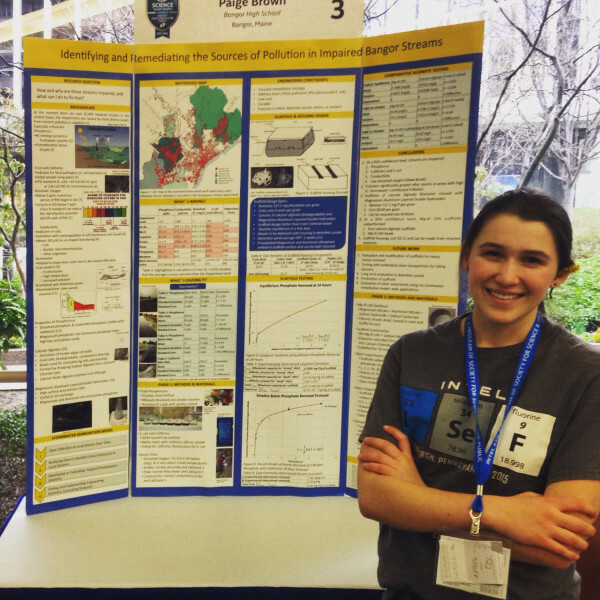 Paige Brown at the Intel Science Talent Search in Washington, D.C. The scaffold housing Paige Brown developed as part of her research project titled "Identifying and Remediating the Sources of Pollution in impaired Bangor Streams." BANGOR, Maine — Bangor High School senior Paige Brown is hoping that the gadget she designed to help clean polluted water will earn her one of the top prizes in the Intel Science Talent Search competition underway in Washington, D.C.
Brown was one of 40 finalists from around the country to be invited to compete in what is billed as the nation’s oldest and most prestigious pre-college science and math competition. “It’s going really well. There’s a lot going on,” Brown said Monday during a phone interview. This time, she’s in the running for one of three first-place medals of distinction, each worth $150,000 in scholarship funding. This year’s winners will be announced during an awards ceremony on Tuesday evening, said Brown. Brown said that although her parents, Heather and Daniel Brown, were unable to make the trip to Washington, her research mentor, Cary James, head of Bangor High School’s science, technology and engineering department, will fly south on Tuesday to cheer her on. More than 1,300 people will be there at the National Building Museum, she said. Perhaps as exciting as the potential for prizes is the opportunity to meet like-minded students, she said. Brown said her project involved identifying the types and sources of pollution impairing the streams in the Bangor area. “What I found was that stormwater was introducing the pollutants and that the two most critical pollutants were phosphorus and E. coli, and so I started building these scaffolds,” she said. The scaffolds, which are chemicals contained in small dispensers, are meant to be deployed in stormwater detention ponds. “They’re about the size of a quarter, and they’re made of primarily what’s called calcium alginate, which is a component of salad dressing actually,” she said. “It’s like a gel and mixed in with that is magnesium aluminum layered double hydroxides,” she said, adding that the magnesium and aluminum ions absorb phosphorous from the water. The scaffold then can be removed from the water and reused and recycled as slow release fertilizer capsules that can be buried with plants or crops, therefore not contributing to further phosphorous pollution, she said. The phosphorous is in fertilizer, industrial waste and organic matter, among other things. Because it is a nutrient, it contributes to algal bloom growth, which blocks sunlight and prevents other aquatic life from growing. While she said she is still waiting for the final data, Brown also is working on attaching silver nanoparticles to the scaffolds to remove E. coli and other bacteria from water. According to Brown, the devices she engineered to absorb 127 milligrams of phosphorus per gram of scaffold cost only 4 cents per gram to manufacture, she said. 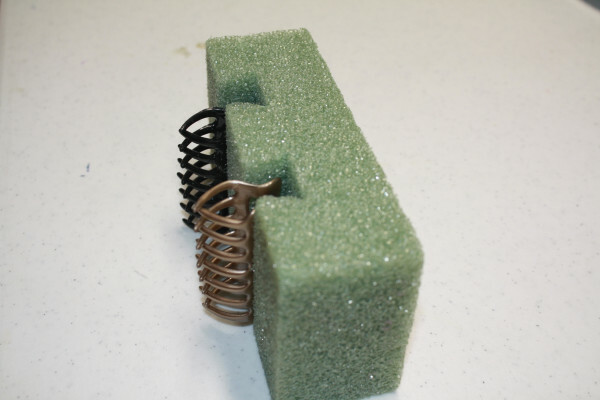 The scaffold housings she designed cost about $3 apiece to make using all new materials but could easily be made with recycled material such as packing foam or an old T-shirt, she said. Brown said she plans to major in chemical engineering and already has been accepted by Stanford, Columbia, Yale and California Institute of Technology. She hasn’t decided what school she will attend. After that, she hopes to create a startup based on her research and manufacture the prototype she developed.